When I think of tweed, the first thing that crosses my mind is elegance! I know that a lot of people don't like tweed because it can look granny and kind of old, but that's not true! You can style it in every possible way. I wanted to show you how you can style tweed skirt to look elegant and chic! When I first saw this skirt it reminded me of a Chanel skirt. It looks so classy! As I wanted to achieve a sophisticated look, I styled this skirt with the white blouse that has a pocket with leopard print. That was a bit risky because tweed is hard to style with different patterns, but it turned out amazing. I decided to go with my Zara block heels because they look vintage and classy. 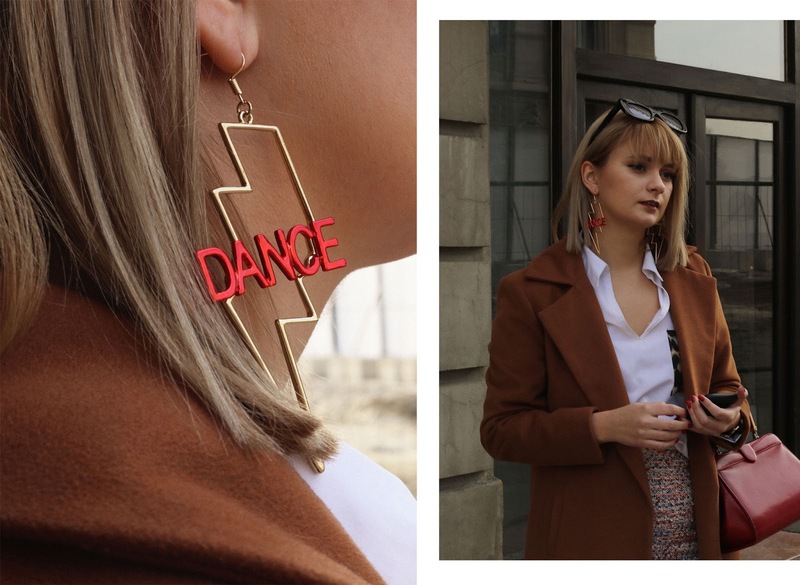 I wanted to spice this look up a bit and I added these large earrings which say "Dance". If you want a piece of clothing made of tweed, my suggestion would be to go with the blazer! It's a timeless piece that you can style over and over again. You don't need to spend a fortune to get one! You should visit your local thrift shops to find one. It's funny how you can find amazing and quality pieces at such affordable prices. You can style it with a blouse, turtleneck or a shirt, depending on what look you want to create. You can style it with a skirt, jeans or pants. It's totally up to you. I really think that tweed blazer is a classic piece that everyone should have in their closet. It's like a little black dress: it won't get out of fashion and there are limitless options when it comes to styling! Let me know in the comments do you like wearing tweed and what is your favorite way of styling it? *This post is done in a collaboration with the Nakturnal agency. For more info click here. You look so amazing in that tweed skirt. I love how you paired it with that tan jacket. I have been wanting to get a jacket like the one you have in the picture. You look gorgeous in your outfit. I really like your tweed skirt because of its unique design. You did awesome winter look. Wow!!! I do really like your tweed skirt you really did a great combination on your outfit and you look gorgeous on it. 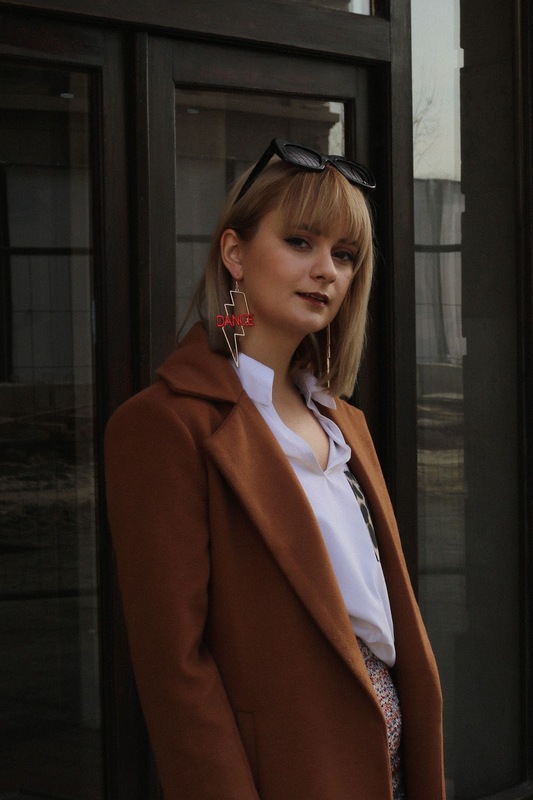 I love this outfit and those earrings are so cool! I would definitely wear this out and about. It looks very stylish and stunning. Thank you for sharing this! I loved your outfit and you look so stunning in it! This could be a perfect look for this Holiday season! That skirt is stunning! I love tweed and as you say it's very reminiscent of Chanel. I love the way you've kept it up-to-date with the earrings and blazer. You look effortlessly chic. You look so chic! I love the earrings! I am big on quirky and fun earrings! Going to keep a look out in H&m when I go in next! Wow!!! I really like your tweed skirt, you got a great dress in your dress and you look so gorgeous.